UPDATED: Fri., July 13, 2018, 9:26 p.m.
1. (12) Christopher Bell, Toyota, 200 laps, 44 points. 2. (5) Daniel Hemric, Chevrolet, 2038. 3. (3) Kyle Busch, Toyota, 200, 0. 4. (2) Justin Allgaier, Chevrolet, 200, 41. 5. (1) Cole Custer, Ford, 200, 49. 6. (8) Tyler Reddick, Chevrolet, 200, 38. 7. (6) John Hunter Nemechek, Chevrolet, 200, 48. 8. (9) Ryan Reed, Ford, 200, 29. 9. (14) Paul Menard, Ford, 200, 0. 10. (4) Austin Cindric, Ford, 200, 40. 11. (7) Matt Tifft, Chevrolet, 200, 33. 12. (10) Elliott Sadler, Chevrolet, 200, 26. 13. (13) Ryan Truex, Chevrolet, 200, 24. 14. (16) Ty Dillon, Chevrolet, 200, 0. 15. (17) Michael Annett, Chevrolet, 200, 22. 16. (19) Ryan Sieg, Chevrolet, 200, 21. 17. (21) Ross Chastain, Chevrolet, 200, 20. 18. (20) Jeremy Clements, Chevrolet, 200, 19. 19. (24) Garrett Smithley, Chevrolet, 198, 18. 20. (15) Spencer Gallagher, Chevrolet, 198, 17. 21. (26) BJ McLeod, Chevrolet, 196, 16. 22. (33) Ray Black Jr, Chevrolet, 196, 15. 23. (30) David Starr, Chevrolet, 195, 14. 24. (36) Spencer Boyd, Chevrolet, 195, 13. 25. (37) Blake Jones, Chevrolet, 194, 12. 26. (27) Brandon Hightower, Toyota, 194, 11. 27. (18) Ty Majeski, Ford, 193, 10. 28. (34) Josh Bilicki, Toyota, 193, 9. 29. (38) Vinnie Miller, Chevrolet, 192, 8. 30. (39) Mike Harmon, Dodge, 190, 7. 31. (35) Chad Finchum, Chevrolet, transmission, 172, 6. 32. (25) Alex Labbe, Chevrolet, 168, 5. 33. (22) Joey Gase, Chevrolet, accident, 161, 4. 34. (23) JJ Yeley, Chevrolet, suspension, 119, 3. 35. (31) Josh Williams, Chevrolet, garage, 107, 2. 36. (11) Brandon Jones, Toyota, accident, 104, 12. 37. (29) Timmy Hill, Dodge, fuelpump, 55, 1. 38. (32) Morgan Shepherd, Chevrolet, vibration, 25, 1. 39. (40) Josh Reaume, Chevrolet, overheating, 9, 0. 40. (28) Jeff Green, Chevrolet, electrical, 6, 1. Average Speed of Race Winner: 131.884 mph. Time of Race: 2 hours, 16 minutes, 29 seconds. Margin of Victory: 0.848 seconds. Caution Flags: 7 for 32 laps. Lead Changes: 8 among 7 drivers. Lap Leaders: C. Custer 1-14; K. Busch 15-79; J. Nemechek 80-93; K. Busch 94-134; M. Annett 135-138; K. Busch 139-143; D. Hemric 144-151; J. Allgaier 152-183; C. Bell 184-200. Leaders Summary (Driver, Times Lead, Laps Led): K. Busch 3 times for 111 laps; J. Allgaier 1 time for 32 laps; C. Bell 1 time for 17 laps; J. Nemechek 1 time for 14 laps; C. Custer 1 time for 14 laps; D. Hemric 1 time for 8 laps; M. Annett 1 time for 4 laps. 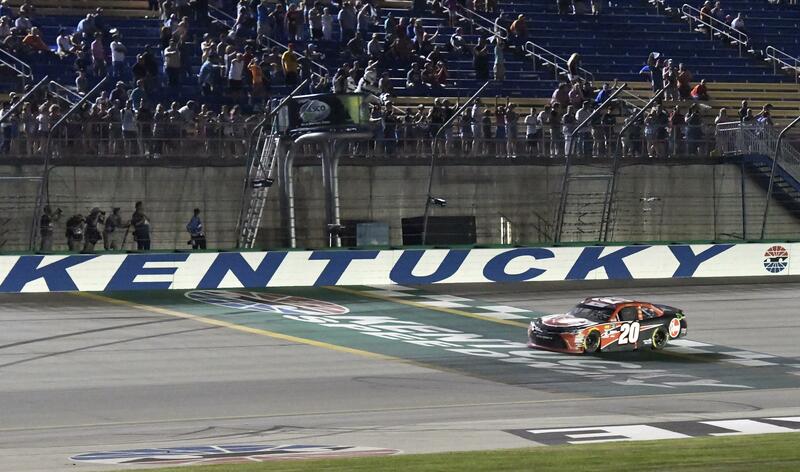 SPARTA, Ky. – Christopher Bell couldn’t have started any worse in Friday night’s NASCAR Xfinity Series race, which made his impressive victory all the more satisfying. Published: July 13, 2018, 8:20 p.m. Updated: July 13, 2018, 9:26 p.m.